Interestingly, the Jewish community of Kansas City is no longer in Missouri, its now in Kansas City, Kansas (across the river). While Rabbi Braver was rav in Kansas City, there was a big “machlokes” which was sparked when a fellow rav in the city “massered” on him during the Prohibition Era, in an effort to have Rav Braver’s permit to purchase sacramental wine revoked. It created a huge uproar. I searched through the personal papers of Rabbi Tuvia Geffen, and in one of the folders is a hachraza admonishing the other rav for “massering” on Rabbi Braver. The hachraza also had a copy of the letter the other rav submitted to the government officials. You can email me privately if you want more info. It appears to me that his Father Reb Moshe Yitzchok Braver was also a Rabbi here in the US in Sioux City (pernounced Sue-City) Iowa. Yd see bbz’s post above. Anyone know who his descendants are? 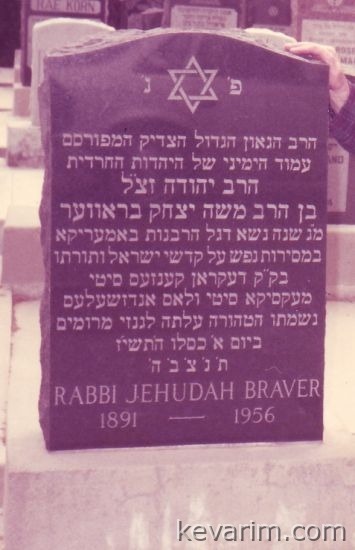 Rabbi Yehuda Braver was my mother’s brother. Her name was Miriam Braver. Coincidentally, my hebrew name is Moishe Yitzchak. My mother married David Siegelbaum and I have 1 sister still living and 2 brothers that are deceased. My Mother died in 1952 of leukemia. As a result we had little connection to her family after that. Rabbi Yehuda Braver was my mother’s brother. Her name was Miriam Braver. His yartzeit 1 Kislev, was yesterday November 4, 2013. May his neshomah have an aliyah.